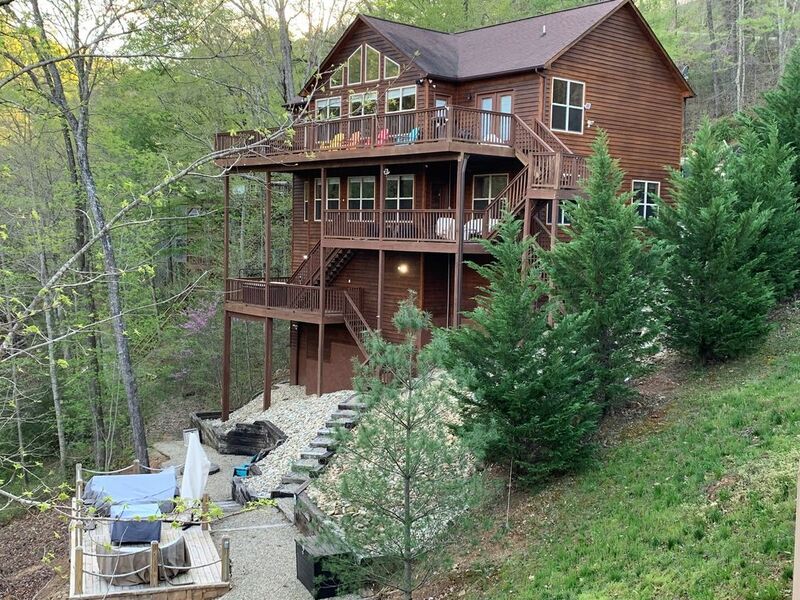 Beautiful lakefront cabin with 5 large bedrooms, 4 bathrooms, 2 master suites, great room, recreation room, fire pit, private dock, and private hot tub. Enjoy the spectacular views and enjoy watching the action of the famous Cedar Creek Jump'n Bridge. This cabin is strategically located just beyond the Jumping Bridge and tucked into a small cove. The results are gorgeous views, no boat traffic at the dock, and ski water just on the other side of the famous bridge. Sugar Hollow Marina is a short 5 minute boat ride and 10 minutes to the wonderful restaurant of Shanghai Marina. Located inside the popular Lakeside Estates "Happy House" offers plenty of parking and easy no steps entrance to the cabin's main level. Enter the cabin to see the huge open floor plan with cathedral ceilings, stone fireplace, TV room, dining room, and large, fully stocked kitchen with stainless steel appliances, granite counters, and island bar. This 'cabin' is truly luxurious. The main floor has a master suite with queen bed, TV, private bathroom, lake views, patio doors to the main level deck. Bedroom #2 provides two sets of full bunks (sleeps 8). A half bathroom is conveniently located near bedroom #2 and the main TV room. The lower level recreation room provides air hockey game and TV room. Bedroom #3 has two twin/twin/twin bunks (triple stack x2) sleeps 6. Bedroom #4 has a queen and lake view. Bedroom #5 is a master suite with king bed, TV, full bathroom, and lake view. A utility room contains the washer/dryer and ice machine. Outside, two large decks overlooking the lake provide plenty of seating, dining, and propane grill. Eat s'mores & marshmallows by the camp fire and enjoy the hot tub (we change water between each rental). The gentle slope leads to your private dock with covered boat slip, uncovered slip, jet ski dock, and swim platform. Ask us about watercraft rental options. For those not wanting to float in the TVA's cleanest lake water, our free community swimming pool & kiddie pool is a short 1/4 mile drive away. ***NOTE***** you must be a minimum 28 years of age to rent this well maintained cabin. John Bertke lives in Dayton Ohio and enjoys visiting Norris with his friends and family. He enjoys fishing and smoking cigars. He started managing this property in January 2018. The Soto family have provided a fantastic property. When I surveyed this cabin I knew that I had to have it in our collection. In fantastic shape, the cabin's open floor plan is quaint and makes a perfect family gathering place. The beautiful backyard leads to a nice dock in a secluded cove. This place is a perfect water playground. Besides this cabin being beautifully decorated, the property located in Lakeside Estates has the strategic location of being isolated from boat traffic yet so close to ski water. All bathrooms provided with bath towels, wash cloths, hand towels. Cabin is located on the lowest level allowed by the TVA. Walk directly from cabin stairs to your own boat dock. Our entire family loved your home. We've been vacationing at Norris Lake for about 18 years and I, personally, think this is the best house we've rented. There was enough room for everyone to spread out. We liked that the path to the lake wasn't steep. The landscaping was so pretty! The inside of the house was decorated nicely. The one thing we would reccomend is that there are televisions in each bedroom. I'm not sure about others, but our family likes to watch TV when we go to bed, especially the children. There were 2 things we had an issue with, but not really a big deal. We had to keep unplugging and plugging back in the hot water heater as the water didn't stay hot. Also, the house phones did not work. We had to make sure our cell phones were on wifi calling in case of an emergency. We all had a great time! I would suggest this rental to anyone. Outstanding home that worked wonderfully for two large families! We enjoyed Thanksgiving, and this home was just a great fit. Kitchen was great, plenty of utensils and cookware. We had so much fun (the dock, the fire ring, the hot tub, the games). This home is well thought out and very well stocked. Just about perfect! Just overall a great set up to host a large group of people / family and accommodating everything you need on a great lake adventure!!! Thanks for sharing your house with us.......we had a great time!!! My family and I really enjoyed our stay. The house is well furnished and has a great view of the lake and jumping bridge. The proximity to several marinas is convenient. The owner was very attentive to our needs and worked hard to make sure we had a great stay. Second time here, great week with the family. House easily held 2 families, home in excellent condition. Thank you for allowing us to stay in your home for the New Year. It was quiet and enjoyable. Lots of amenities and well equipped. It was a great way to ring in the New Year.